Taken with Olympus E500 digital camera March 20th 2008. Click image for larger view. Here I have photographed water drops falling from some icicles that were melting on a sunny day here in Northern Norway. 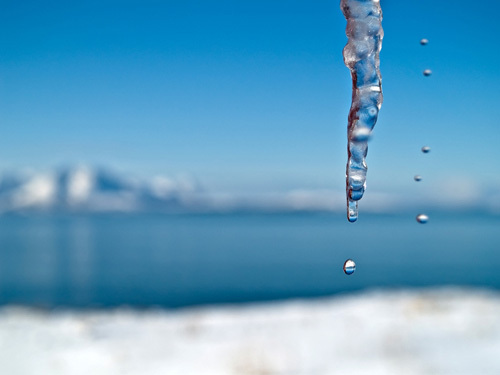 In the picture I used the fjord and snow clad mountains as a background to the icicle. I also used a low f-stop to get the background out of focus as I wanted the icicle and water drops to “pop out” in the photo. Check out my other macro photo of a falling water drop. The sun is already starting to kill winter. Excellant capture. I found it a photo pertainaing to change. Sudden change. Thanks for the words of encouragement it is much appreciated. I just love your icicle picture, the capture is just spot on. Like Wangbu I feel it could also be used to show how our world is changing in respect of global warming. Amazing. I felt like I was holding my breath looking at this photo, such a quick glimpse. I’m from a very warm place (we’re expecting it to be 30C today), so this sight has almost a mysterious element to meâ€“a scene never to be seen during our winters. Lovely. congrats on a fine picture yet again! keep it up.. I agree with Dano, you are GOOD. The water droplets and icicle are nice but I also like the way it looks in the background. It has me wondering what it all looks and feels like. Amazing work! It almost appears as if the other water drops are defying gravity and melting away perpendicular to the icicle. Great capture, Thomas — and your use of the “blurry” background did indeed make the water droplets “pop out.” Well done. Amazing work dude and hopes for we northerners awaiting spring! Exquisite color and clarity in this photo. good for wallpaper 🙂 I take it……..
What a simply amazing photograph. It literally took my breath away ! That is fantastic! Good job. Incredibly beautiful! Thank you for sharing.